In a time when women are increasingly prominent in business, law and medicine, there continue to be relatively few female scientists and engineers. According to the U.S. Department of Commerce, women filled 47 percent of all U.S. jobs in 2015 but held just 24 percent of science, technology, engineering and math (STEM) jobs. The good news? It’s a topic that is being actively discussed in education, play and popular culture. There is an opportunity to expand the number of women in STEM-related careers, and thus contribute to the overall strength of the industry. I’m passionate about setting an example — both inside my company and through volunteer efforts in the community — and encouraging girls to follow my lead. Here are five simple ways you, your organization or your community can get involved in supporting women in STEM. Exposing girls as young as preschool age to STEM at the very beginning of their education — and continuing to engage them throughout middle and high school in age-appropriate ways — allows parents and educators to capture incredibly active learners and retain them through ages when interest might wane. As an example, make early science teaching a priority by pushing further than “Head, Shoulders, Knees and Toes” in anatomy. Have kids identify their skulls, ribs, femurs, tibia and mandibles to increase interest and confidence in science from the start. Share stories of the incredible female pioneers in science fields, such as Marie Curie, Jane Goodall or Maria Mitchell. Often, girls who showed an aptitude and interest in science lose that momentum by the end of middle school. It’s especially important to continue to provide avenues to cultivate their STEM interests in elementary school and throughout their education. Bringing more women into STEM-related careers is essential to the future of technological innovation and economic competitiveness. Keep in mind that both recruitment and retention are equally important. Most STEM organizations are actively seeking female interns and trying to convert them to full-time employees. However, the issue of how to retain them should be just as much of a concern for many teams. Women across industries in the United States often hit a wall when trying to juggle work and family. STEM organizations specifically should initiate solutions like internal mentorship, networking opportunities for women, and professional organization membership in affinity groups. Each of these has helped me achieve a successful career. Ultimately, it must be a part of company culture, and it has to start at the top. The adage is that you can’t become that which you can’t see. Female role models can have a tremendous impact on girls and women. There is no evidence that girls are less capable in STEM fields, but research does show that they tend to feel that way because of gender stereotyping and subconscious bias. Schools and organizations can actively combat this by recognizing the achievements of girls in STEM-related activities and telling the stories of female role models in STEM-related fields. Regardless of gender, all people can be part of the path toward equity and the advancement of women in STEM fields by recognizing and celebrating the stories of women who have touched their own lives. At Burns & McDonnell, we are lucky to have many strong female role models, including Vice President Renita Mollman and President Leslie Duke, who actively engage in mentoring and encouraging talented women. 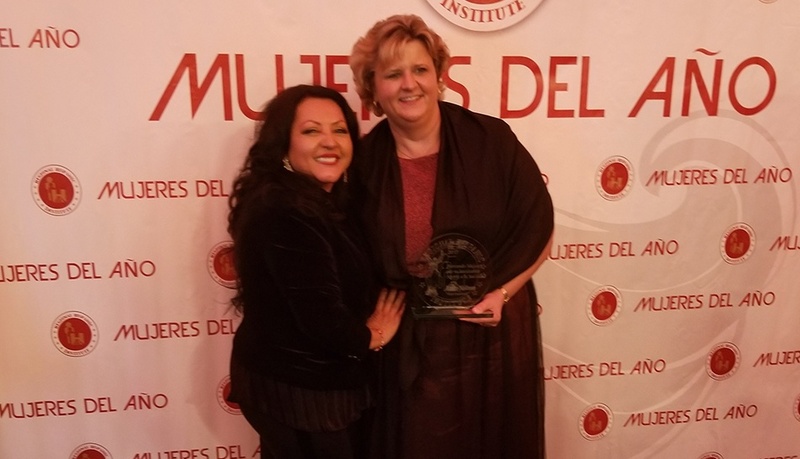 Burns & McDonnell Vice President Renita Mollman (right), head of our Southern California operations, was selected as one of the Women of the Year by the Regional Hispanic Chamber of Commerce, recognizing her commitment to the community, business diversity and leadership. Take proactive steps as parents and educators to support women and girls in STEM-related education and activities. Send inclusive messages about who makes a good science or engineering student, emphasize the real-life applications of STEM education, and work with educators to avoid stereotypes and subconscious gender bias. Consider sponsoring social events to help integrate women and girls into clubs that are science, math, engineering or technology-focused. Provide an opportunity for interaction of girls and women with an interest in STEM to support each other, in addition to those who support them. I always find these events offer encouragement to all involved, both participants and organizers. 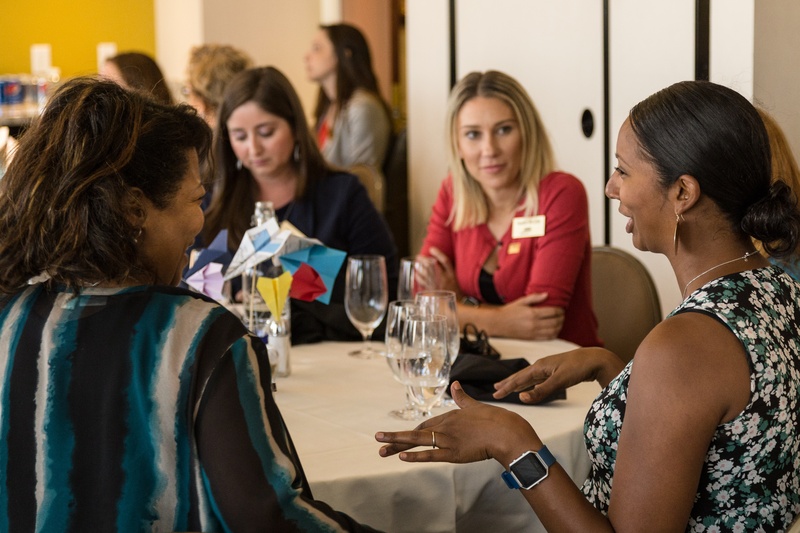 A WTS San Diego Women in Aviation event encouraged one-on-one interaction and honest feedback from women at the top of their game. Here, participants and panelists discuss career challenges and opportunities in small groups. Look for STEM industry partners for dedicated STEM events and programming. For example, Burns & McDonnell has a program called the Professional Women’s Exchange, which is a monthly forum to allow women to connect and share our common experiences and challenges. Youth-focused events, including the Burns & McDonnell Battle of the Brains and STEM in Your Backyard, expose youth to interactive STEM experience. We’re not alone. Identify STEM organizations in your community and see if they have programs that you can get involved in. We’re all in this together. The interest in empowering girls in STEM-related fields is encouraging, and the future is bright. As a community, the more we encourage and empower women, girls and members of minority groups to make choices that support them in tackling professions in the STEM fields, the better for us all. Explore ways for students and educators can get involved in promoting STEM education.